What is it? Do you need it? How does it work? 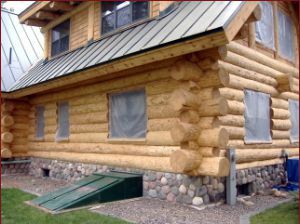 Edmunds and Company has been blasting log homes for over 30 years. Over the years, we have developed our skills, tried new products and honed our trade. This experience gives us the confidence to take on jobs that others won’t. It’s important to understand how the sandblasting or cob blasting process works. 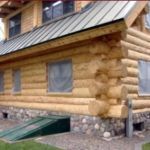 Look below for some important answers to questions you might have about blasting your log home. Edmunds & Company uses sand, crushed glass and corncob for our blasting media. Our experience has taught us which media we need to use to effectively remove a given stain or paint. About 75% of the jobs recently done were done using crushed glass. Crushed glass, which is not sharp but rather resembles white beach sand, is silica free. Will my house leak and will dust come inside? Most likely yes, to some degree. 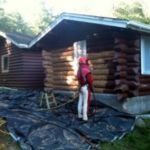 When blasting, the velocity of air outside is equivalent to that of a hurricane so if you think a little bit of wind might come through your house in a hurricane, then a little will come in during sandblasting. We monitor this while blasting and if a significant amount is coming in, we drape the interior walls to keep the dust from getting on horizontal surfaces. It is not possible to promise a completely dust-free process, but it is possible to minimize it. Edmunds & Company takes the time to do just that. Where does the material go after it hits the wall? We take great pride in being a “clean” company. Our customers frequently comment on how our crews take the time to clean up carefully throughout the job. 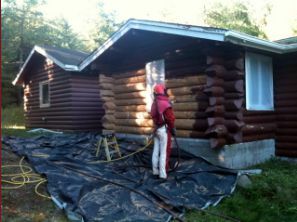 We lay tarps down around the house to catch the blasting media and the old paint or stain that is being removed. This material is then collected from the tarps and properly disposed of. About 10% of the material falls in the surrounding area off the tarps. This extra will either be swept up or will wash away in the first couple of rains after the job is completed. What will the texture of my logs be like after the sandblasting process? Edmunds & Company has a dedicated crew that is experienced in the sandblasting and cob blasting technique. 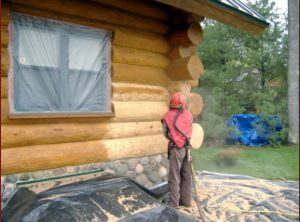 We do out best to leave the surface of the logs as smooth as possible, leaving very little of the old finish on the logs. At times the grain of the wood gets raised slightly and the logs are a bit rougher than before. 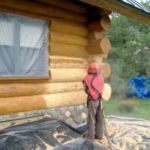 In some cases, it may be necessary to sand or scrub the logs to smooth out the surface but most projects don’t require any sanding after the blasting is complete. When do I get to pick the new stain for my logs? Sometimes this decision is made prior to starting the project after a discussion of what the options are. Edmunds & Company works closely with the customer to find out what they prefer in terms of the new look for their logs. 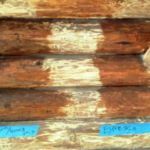 Different samples and colors of stain are applied to the freshly blasted logs, which allows the customer to make a more informed decision. 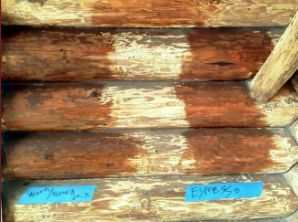 Once a stain color is chosen, we blast the samples off the building and the new stain is applied using a sprayer and then back-brushing. Watching the old stain disappear and the new wood being exposed. The new wood was just waiting underneath the old stain. The surface is ready to accept a new stain and a fresh look. Do you have other questions or concerns about sandblasting or cob blasting? Call the experts. Call Edmunds & Company at 715-373-5744 or email us at info@restorelogs.com. Let us put your mind at ease.